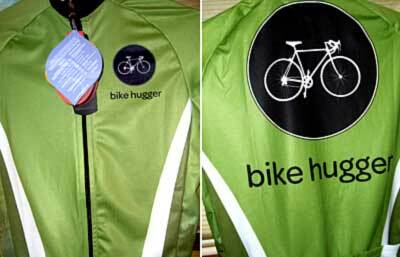 Our Bike Hugger jerseys and shorts just arrived – I’m unpacking the boxes, sending kits off to Bermuda with Team Bike Hugger, and we’ll wear them at Interbike for the crit. Our designer Grayson gets the big props and thanks to Hincapie for an outstanding job making them for us. After seeing the kits, Jason joked that they looked like “superhero outfits.” Yeah, but Superhero Hugga Style! We’ll have a limited amount of jerseys to offer our readers. Interested? Let us know in the comments. This photo shows the front/back of the jersey. The side panels include the cityscape and trees from our banner. For more details on the jersey, check the update post and the jersey purchase page.